In Bill Finger's classic 1939 origin sequence, Bruce Wayne is depicted as having been inspired into his life of fighting crime as The Batman, by a wayward BAT that flies into his study from an open window. 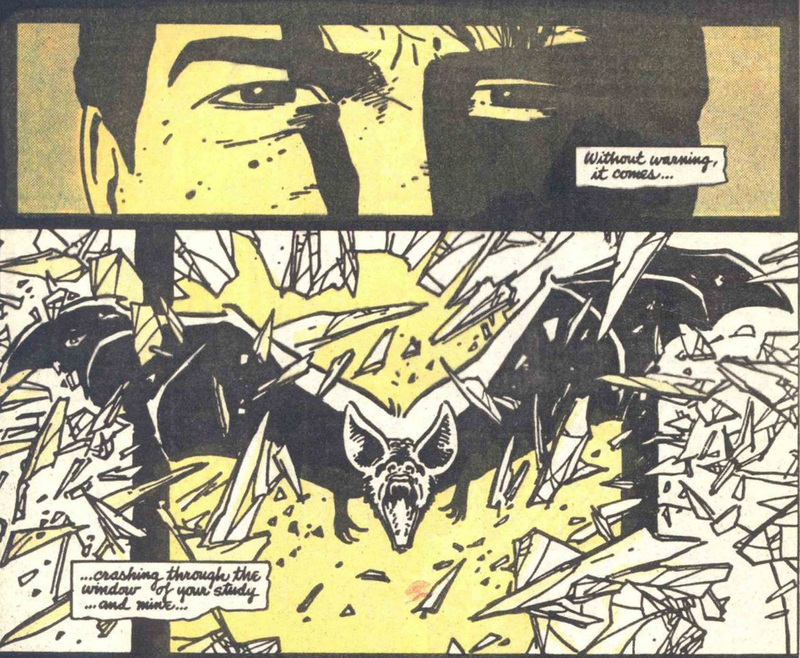 Decades later, writer Frank Miller and artist David Mazzucchelli gave the iconic origin sequence a grander, more operatic interpretation in the now-legendary BATMAN: YEAR ONE. Inspired by Miller's more figurative and spiritual approach to the origin story, playwright Roberto Williams designed a scene for the stage that would evoke the power and grandeur of a death / resurrection theme... with Wayne's body possessed by the very essence of the ancient and frightening creature! From the earliest stages of pre-production, it became clear that a simple $2 Halloween rubber BAT dangled from a bungee cord would NOT be an adequate approach to the presentation of this creature. In order for the sequence to have the moody impact that Playwright / Director Williams intended, he realized that it would become necessary to design and construct a realistic FLYING BAT ROD PUPPET that could perform on-cue on the stage with elegance and majesty. Williams rendered a production design of a rod-controlled puppet that would feature a working / folding wing mechanism based off the inner workings of a basic umbrella! After a long search for a suitable creature fabricator, the playwright eventually enlisted the considerable talents of Ann Arbor, MI-based artist Mr. David Bicknell to fabricate the working rod puppet. Mr Bicknell has created BATS, and Ghosts, and Goblins, and Ghouls since 1992 as part of his fascination with Halloween, and he proved to be the PERFECT man for this job! Within three weeks of Williams' first contact with him, Mr. Bicknell submitted these two tantalizing images of his progress with the puppet's inner wing mechanism and head sculpt. The photos sent a shudder of excitement throughout the FOTDK production team! These photos of the finished BAT rod puppet do not do it justice! It is a stunning example of ingenuity, craftsmanship, and old-school professional artistry! ... and rod-controlled articulated wings which spread open to a spectacular 36-inch span!! !